The Original Legends of Rock n’ Roll presents the music of world-class tribute acts performing a collection of hit songs from the greatest Rock’n’Soul artists of all-time… together with the Legends all-star band featuring “Mr Sax” Johnny Ferriera! 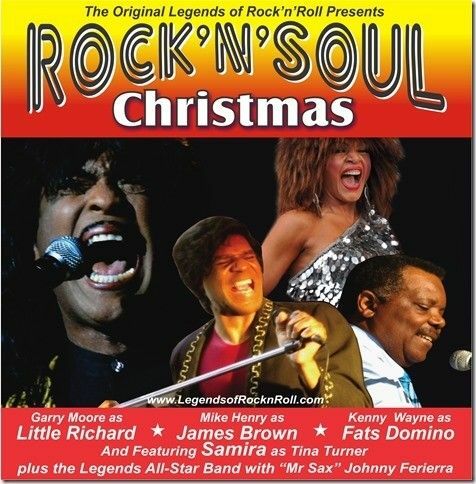 Garry Moore returns to Canada as Little Richard… and he is joined by Kenny Wayne as Fats Domino… Mike Henry as James Brown and introducing Samira performing as Tina Turner… backed up by The Legends All-Star Band. It’s a fabulous “Oldies Rock’n’Roll show”… just like the old days when the music was pure and simple and played the way it’s supposed to be played. A ROCK’N”SOUL CHRISTMAS is a fun-filled Rock’n’Roll show featuring all the big hits of the featured artists together with a sprinkle of seasonal favourites.